When you want to apply for a job, you may give the recruitment agency a resume or a CV in order to show them your work and education history. Both of them are meant to introduce you to the employer and show them that you are capable of the job. Which one you use depends on where you are in the world, what you want to accomplish with it, and what your work history is. The word ‘resume’ comes from the French word ‘résumé’, which means ‘summary’ or ‘summation’. 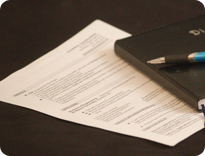 A resume is a short overview of your work history, with maybe a few other things thrown in. Most other details will be provided in a cover letter or in a form application. CV stands for Curriculum Vitae, which is a Latin phrase that roughly means “the course of my life”. This tends to provide a complete overview of your work history, as well as any qualifications and skills, accomplishments you have made, your education history, and any personality traits you feel will make you stand out from the other applicants. The CV is much more in-depth than the resume is. Regular CVs are supposed to be two A4 pages long, though it is fine to have a shorter one or a longer one depending on experience. Resumes are roughly as long, paper-wise. However, CVs are usually printed on A4 paper, which is slightly longer than North American paper, and their print is more often smaller, so there is more information per page. They both go from one to two pages long: one page for newcomers to the workforce and two for the average person. For both resumes and CVs, it is acceptable to use three pages for people with more than ten years of experience, especially if that includes managerial experience or other important administrative work. One exception is when applying for a job that includes research or academic work. Due to the nature of those subjects, the CVs can be from four to five pages long. So, when do you use a CV and when a resume? That largely depends on what country you are in. In the United States and Canada, you would only send a resume for most jobs, since that’s what is normal for these countries. Any other information the company requires is often sent in the form of a cover letter, brought up in interviews, or asked for on the job application form. However, some academic or research positions do ask for CVs. In the United Kingdom, Ireland, and New Zealand, they only use CVs, never resumes. In most of mainland Europe, CVs are much more common than resumes, though you may find some in a few countries. In many other countries, such as Australia, India, and South Africa, both CVs and resumes are commonly used, and in some places the terms can refer to the same document. Which one is used generally depends on the nature of the work. Overall, jobs in the private sector usually ask for and receive resumes. Public service jobs are usually given CVs instead. The major exceptions to these rules are when companies from one set of countries create jobs in another. For example, if a United States company sets up a branch in England, then the England branch of their company will likely accept both resumes and CVs. So, resumes are short summaries of a person’s work history, while CVs are a more thorough view of their credentials. In the North American countries, resumes are more accepted. In the UK, Ireland, and New Zealand, they only use CVs, and many of the other Commonwealth countries use both. Kianna. "Difference Between Resume and CV." DifferenceBetween.net. August 7, 2017 < http://www.differencebetween.net/business/difference-between-resume-and-cv/ >.